The community meeting will provide the public an opportunity to express their views on the possible replacement or rehabilitation of the Long Bridge across the Potomac River in Washington, DC. The existing two-track rail bridge was constructed in 1904 and serves freight (CSX Transportation), intercity passenger (Amtrak), and commuter rail (Virginia Railway Express) traffic. The community meeting will focus on recent project activities, next steps in the planning process, and provide a general overview of the environmental resources which have been identified within the project corridor. DDOT completed an initial (Phase I) feasibility study of the Long Bridge in January 2015, which conducted a preliminary evaluation of various concept designs for upgrading the existing bridge, identified opportunities for multimodal connectivity and operational improvements, and determined existing and future capacity needs of the bridge. The Long Bridge Phase II Study, currently underway, is expanding on the information from Phase I to advance the project through the initial stages of the National Environmental Policy Act (NEPA) process. FRA and DDOT anticipate that an Environmental Impact Statement (EIS) will be prepared for the project. In an effort to streamline the NEPA process, the Phase II Study will prepare a draft purpose and need statement, and conduct a preliminary screening and analysis of alternatives for the bridge replacement. For more information, visit www.longbridgeproject.com or call (202) 479-2707. And in case anyone is unclear about what that means, in addition to identifying rail options (either a base case of renovating the two track bridge, or the more likely outcome of expanding it to four tracks) they also looked at adding either transit lanes for a streetcar (probably dead now that ArlCo has killed their street car project) general travel lanes (IE for cars, buses and maybe bikes?) and bike/ped paths. 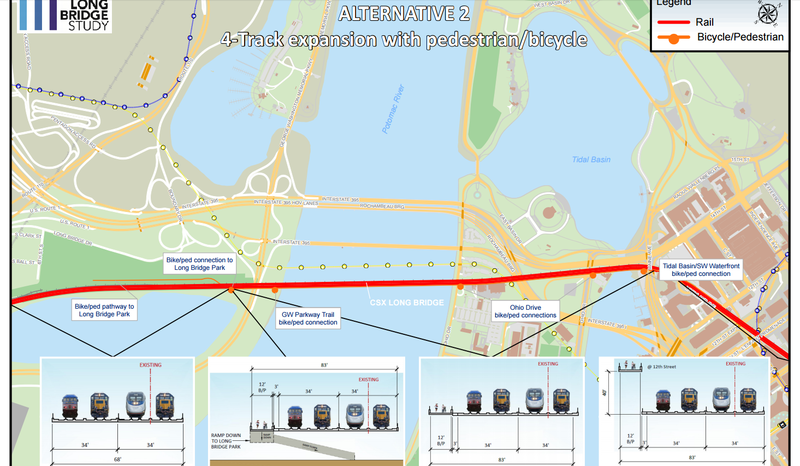 Which latter would significantly improve connectivity from NoVa/MVT to Hains Point, the SW Waterfront with its new development, and the Navy Yard area, and would provide some relief to the 14th street bridge path. I believe this is also the project that we were hoping would connect Arlington's Long Bridge Park to the MVT via a bridge over the GWMP. More like the dream of the next generation. Seems like this is on a 10-15 year schedule. Not that we shouldn't push for improved bike/pedestrian and multimodal connections though. The people in the 1960s, 1970s, 1980s, 1990s and early 2000s paved the way for much of the bike infrastructure we have today, including the MVT bridges over the ramps at National Airport, the bike path along the Wilson Bridge, Capital Bikeshare, etc. Some of those advocates didn't really get to benefit from all of the projects because they took so long to develop and build. I'm grateful for their work, and that's a reason to continue to push for improved and safer multimodal infrastructure. As for the streetcar, I wouldn't quite call it dead. It's officially dead for now, but nothing prevents the idea from being revived later on. Probably not right away, but when traffic continues to back up on Columbia Pike over the coming decades, there could be another push, for either a streetcar or perhaps a MetroRail line (depending on how dense development is along the Pike and in Bailey's Crossroads 10, 20 or 30 years from now). The replacement of the Washington Blvd bridge over Columbia Pike was designed to accommodate a streetcar line. That is still the case, even though the streetcar project was canceled. That's a long way off in the future, but so is the Long Bridge replacement. It makes sense to anticipate long-term transportation needs for such a project. Last edited by PotomacCyclist; 01-15-2016 at 12:16 PM. 10-15 years isn't next generation when you're talking infrastructure. For some people it might be, those in their 60s and 70s. They may not be riding in 15 years. Them's fight'n words. I'm going live and ride forever. I would be surprised if they added a pedestrian/cyclist phase all the way across the river here. It's always worth asking. But I would be happy if they connected Long Bridge Park Crystal City over to MVT. I think that alone would be tremendously helpful. But then again, I suspect this requires NPS so I'm not holding out hope.